Brick Town Talk: Inspiration of the Day - 1/29/12 - LEGO Town, Architecture, Building Tips, Inspiration Ideas, and more! 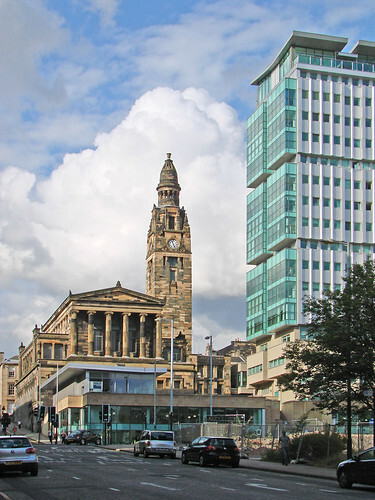 Glasgow, Scotland, UK - (BTT) When you think of great Greek Revival architecture, chances are the first place to pop into your mind isn't Glasgow, but perhaps it should be. One of the greatest architects of his time, the appropriately named Alexander "Greek" Thomson, only recently gained the fame he deserved outside his home town in Scotland - certainly better late than never. His St. Vincent Street Free Church, completed in 1859, is the most intact of his three monumental churches he built in Glasgow, providing a very nice contrast to the less traditional (to put it nicely) buildings in the neighborhood.